What’s going on in our country right now, at its most basic level, is that a large swath of the population (I’m gonna call it 70% of women, 60-80% of POC’s depending on religious affiliation, and 30% of men) have recently exploded – since the 2016 election – with a rage so enormous and so powerful, it’s thrown everyone else back on their heels. Let’s be clear that “everyone else” isn’t just white men. There are plenty of women and POC’s in there too, and of course some white men are staunchly opposed to toxic masculinity and its abuses. Since it isn’t a men vs women thing, nor a black vs white thing, it’s hard to give it an accurate label. But now that you understand what I’m talking about, I’m gonna call this group of “everyone else” Toxic White Men, or TWM’s for short. “Where is all this rage coming from?” the TWM’s asked initially, somewhat stunned. But of course they didn’t actually care about the answer, as they trusted it would soon die down. After all, “minority groups” have gotten testy before, and powerful white men have always been able to quash the disturbance before it caused any meaningful shifts in the culture – or heaven forbid, changed our systems of law, government and finance. But it’s starting to look like this particular wave of rage might actually have some staying power – so now the toxic white male patriarchy and all its beneficiaries are starting to pay attention. But instead of actually getting curious about the rage, they’ve become defensive and are now fighting back with every dirty trick in the white male power abuser playbook. 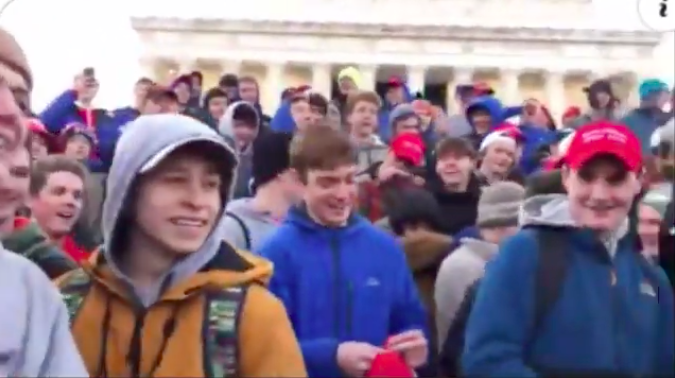 The incident that’s got the entire country slinging verbal rocks at one another this weekend is a video of some Covington High School students mocking a Native American elder of the Omaha tribe while he performs a drum song in the style of his tribe. In case the words ferocious, fury and wield didn’t clue you in – I am a woman filled with righteous fury, and unapologetic about expressing it. Their lame imitations of an Indian from a spaghetti western is classic, garden-variety racial prejudice and ignorance. Doing it while wearing 2019’s version of a Klansman’s hood – the incendiary red caps of the Trump regime – elevates it to the seriousness of mob intimidation. Were there other people present on the fringes of this incident who were also doing stupid things? Apparently there were, yes. Does that excuse or negate the mean, ignorant bigotry displayed by these teenagers? Absolutely not. So let’s stipulate that this group of privileged white teenage boys in their MAGA hats bullied and racially harassed the Native American elder playing his drum. What should the consequences have been, in a perfect world? And somewhere in all of that, they would hopefully have embarked upon a path of deep soul-searching. One in which they came to clearly understand exactly why their behavior was wrong, and what steps they could commit to taking that would keep them on a much better path going forward. So is what’s happening to them “fair?” No. Is the reaction they’re getting constructive? Definitely not. And IMHO it’s the apparent over-zealousness of the reaction from the left that’s once again got the right in an uproar. People on the right are feeling positively sucker-punched by the tsunami of rage this incident has catalyzed. Is the Left’s rage justified? But let’s imagine what would have happened if social media wasn’t an instantaneous rage machine. If the video of the incident hadn’t gone viral, but instead had just been brought to the attention of the school and their parents. Of course it wouldn’t have. Especially given everything Google has taught us in the last 48 hours about the toxic, bigoted, misogynistic culture of Covington High School. If this community had been left to “deal with” these boys on their own, they would have received no meaningful reprimand whatsoever. How do we know? Because their school – which is of course supported by their parents – actively encourages the kinds of attitudes on which these boys’ behavior was based in the first place! So is the rage from the Left justified? As you answer that question, please remember that the rage isn’t about just this one incident. The rage is about every act of humiliation, abuse, intimidation and violence – large and small – that groups of privileged white men have been inflicting on everybody else for millennia. And the rage is about the fact that these abusive acts have always gone unpunished. And the rage is about the fact that finally, for the first time in history, the accusations of abuse are being heard in this country. They’re being taken seriously in at least some corners. A few powerful men have been made to pay for their abuses, and the systems that spawned them are slowly beginning to be examined and fixed. Yet many TWM’s are some combination of terrified and enraged that these systems of toxicity and patriarchy are threatening to be dismantled before their very eyes. In response, they’re trying to gaslight us back into silence and submission – with propaganda like what’s filling the right-wing airwaves this weekend about how these boys are such innocent victims. So the rage is the full-throated refusal to allow TWM’s like these boys to weasel out of consequences even one more time. But all this rage makes civil discourse so difficult! I can see how, from the perspective of TWM’s, the rage might feel like a massive overreaction. After all, TWM’s by definition have been oblivious since forever about all the injustices that have made the rest of us so pissed off. But guess what – toxic white masculinity with all its abuses is unjust, whether you’re able to see those injustices or not. We who are enraged are absolutely in the right on this issue. And to those in the middle who say, “But when you get so angry, it just makes it so difficult to talk to you!” all I can say is, you just don’t get it. THEY have been inflicting violence on US for millennia – not least of all, by muzzling our voices, denying the injustices, disregarding our very humanity. So for YOU – who pretend to be our allies – to now suggest WE should just stop making such a fuss, is almost as infuriating as the abuses and violence themselves. No, good sir, we will not be silent. We will not diminish our rage. And if you think that makes civil discourse impossible, then I suggest you go talk to THEM. If they would say that, everyone else – those of us who are enraged – would retract our claws. We would become discerning with our bloodlust. We would give most TWM’s the benefit of the doubt that given the chance, they’ll decide to be better. But TWM’s can’t even watch an anti-bullying commercial from a razor company without their fragile little egos feeling like the whole world is accusing them, personally and individually, of being rapists. No matter. Have sword, will wield.